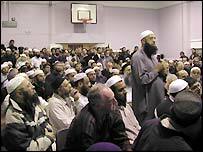 Muslims in Gloucester are reeling from the arrest of a terrorism suspect in their city - but at a large public meeting most of their anger was reserved for the media and the Home Secretary, David Blunkett. Outside the closed gates of the Colewell Centre on Gloucester's Derby Road, they were not happy. 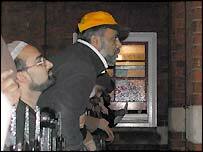 They had come to debate the arrest of Sajid Badat - but fire regulations said the doors had to close. And so, a few dozen concerned residents found themselves outside in the drizzle, peering through the windows as the capacity audience of 400 listened to police officers, councillors and the local MP. Gloucester's Muslim community is small - approximately 2,500 people of mostly Indian Gujurati heritage, their families having first arrived 40 years ago. While those attending the meeting were predominantly Muslim, all ages and backgrounds were represented. Ahmed Goga, one of the spokesmen appointed in the wake of the arrest, decided to make an obvious point by turning up in his Gloucester rugby shirt. "These people are Gloucester through and through," he said. "We have helped build Gloucester for 40 years and we do not want to be smeared." The presence which hung over the meeting was that of Sajid Badat. He was 100 miles away at London's Paddington Green police station. His family were elsewhere in hiding. Imran Atcha, a family friend, opened the meeting by saying a few words on their behalf. "The family are very, very grateful for all the support and letters they have received," said Imran. "It just shows that we are all behind Sajid Badat because we know he is an innocent man." But despite this sentiment, the majority in the audience accepted the wheels of justice were now in motion and should be left to run their course. Instead, they wanted answers from the media. National tabloids were branded "filthy and racist" - and harsher words were reserved for local paper The Citizen. Their newspaper had let them down with headlines about suicide bombers, they argued. "Bad news sells but it does not do communities any good," said one man. "This is bad enough already, it doesn't need sensationalising." The newspaper's editor Ian Mean had a prior commitment so one of his management team, Matt Holmes, was on the receiving end. As Mr Holmes stood up, he was loudly booed and looked deeply uncomfortable. "We have bent over backwards to make sure we have covered this fairly," Mr Holmes said as the jeers got louder. "I'm not here to be shouted at." "All we want is that you report the truth, nothing more," came the reply. But the most ire was reserved for home secretary David Blunkett, who spoke out in support of the police action after the arrest of Mr Badat. Many demanded his resignation, saying he was "building walls between our communities". Another elderly man, Yousef Malik, said he was immensely proud to be a British citizen - yet he and others were now being regarded with suspicion simply for wearing a beard. Another accused Mr Blunkett of showing Gloucester's Muslims enormous disrespect. "You have not arrested an individual but an entire community," he said. 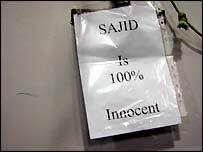 "Sajid is innocent and so is this community." The Reverend Michael Butler, the local vicar at St James' church, said his 17 years in the city's multicultural community had been his happiest. But he reflected the concern of many non-Muslims at the meeting, saying: "We are a wounded community. Today there is hurt and a lot of anger." And hearing all this was constituency MP Parmjit Dhanda. 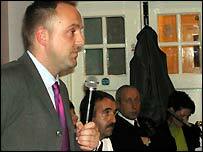 Did the Labour man stand with the community or with the home secretary? Mr Dhanda explained he had held behind-the-scenes meetings with members of the community and, as promised, would be taking their concerns to David Blunkett. "People here are working together and I am determined not to let anything ruin that," he said. "We will keep the level of harmony in our community." Gloucester's Muslims feel their community has been unfairly tainted - and it is a feeling they share with many other communities. Last month, Europe minister Denis McShane sparked fury by saying Muslims had to choose between the rule of law and the rule of terrorism. David Blunkett's comments on Mr Badat's arrest have added to this fury. "We are always expected to apologise for something that we have not done," said Ahmed Goga. "Everyone in this community has condemned 9/11 time and time again. But we are being demonised and castigated despite being British through and through. "Well a lot of us feel that we should not have to do it anymore - and it's time we made a stand." "All insisted they were there to listen"